Home/Beaches, Family, Parks, West County/Let’s Go Fly a Kite! The good weather this last weekend was worth celebrating. It has been a long rainy spring, which has happily brought us out of our drought but has definitely had me in the doldrums lately. In honor of the sunny days I wanted some good frolicsome fun so we loaded up the car and headed to Bodega Bay to go fly a kite. Not being regular kite flyers we didn’t even own a kite but that was easily remedied in Bodega Bay. 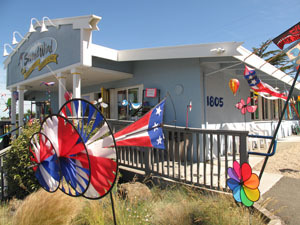 I’ve often looked longingly at the kite shops along Highway 1; their colorful windsocks twirling and whimsical spinners whirling vigorously in the wind. They just look so happy. Between Second Wind and Candy & Kites your kite and other wind toy needs are amply met. In fact, we had no idea how many options there were in making a kite purchase. 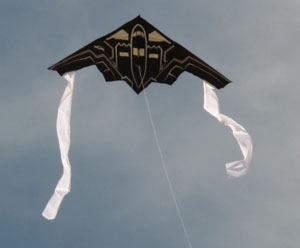 The slick stunt kites were tempting but ultimately we decided on a more practical 56” Delta Kite in a stealth bomber design (my son likes planes), black with sliver and white detailing. We headed to Doran Beach to launch our little aircraft. Doran is home to the annual Castles and Kites Festival held at the end of April. It is a primo kite flying destination. 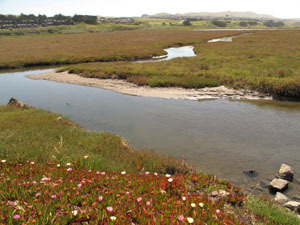 We miscalculated the turnoff and ended up in the parking lot for the Bodega Bay Bird Walk. There were signs for Doran Beach so we decided to just park and walk. Had I known it was a 0.4 mile walk I might have ditched the overloaded diaper bag but the scenic stroll through beautiful wetlands was worth the extra effort. 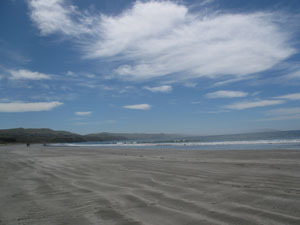 Doran is a truly stunning stretch of sandy beach. It is easy to access but has an attitude of isolation, arching out into the bay like it is trying to disconnect itself from the coast. The Bird Walk trail brought us to about the middle of the arc. The beach was still pretty empty but a steady trickle of people slowly made encampments along the shore. There were bathing suit clad sun worshippers, wetsuit wearing surfers, Togg toting fishermen, and people like me; my Anglo-Celtic roots relegate me to hats, long-sleeves and plenty of sunscreen. Somehow I still get sunburned. Once we hit the sand our son made straight for the soft rolling surf and splashed around with excitement. He’d never flown a kite and, at that moment, could have cared less that his dad was swiftly flying our stealth bomber in the sky. The wind waxed and waned. We watched a nearby family unsuccessfully try to launch their rainbow colored stunt kite. As the morning progressed, the winds picked up and I could have left the kite handle secured under a rock and walked away; the kite practically flew itself. I don’t know why it had been so long since I flew a kite. It is such an uplifting and free experience. As midday approached we headed off to grab lunch at a local deli and then took the long way home, enjoying what was left of a beautiful day. Our kite has been added to the growing stash of stuff we keep in the SUV. We’ll be back again. A stunt kite may even be in our future. If you have any kite flying destinations to share, please leave me a post here or on Facebook.